Kayapo denomination concentrates several ethnic subgroups like Kayapo Gorotire, Xicrin, Metuktire, Kuben-Kran Ken, Txcucaramae ......., which all live on indigenous territories in the Para and Mato Grosso Brazilian states. 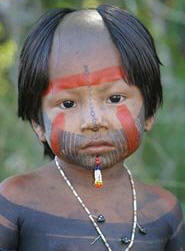 Kayapo tribes like all indigenous communities keep a narrow relationship with the surrounding Nature. As per their conception of the Universe, all living beings, cosmos, plants, water, animals ..... are intimately bound and form a cohesive set. Each living being exists through the conservation of this relationship. We will only ensure the continuity of our life and of the biodiversity in keeping equilibrium on the overall planet. For instance, insects and birds are essential for ensuring dispersion and fertilization of plants and trees. Amazonian Amerindian tribes express their relationship understanding with Nature through their body paintings, their rituals and their daily life, which consists of taking without exhausting. 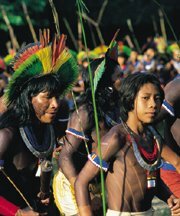 For the Kayapo tribe, all Amerindian people are Mebengokre, which means in their language: tribe from water. In the Kayapo culture, water element is celebrated through a very important initiation rite, in which they will prove their resistance. This rite ends with a big fishing party using plant roots, which enable to temporarily decrease oxygen level inside a specific river area and therefore to catch an important fish quantity. Ten years ago the gold diggers, who use mercury, have threatened their rivers, which are essential to their survivals and to those of their environment, so that the population and the whole ecosystem has been endangered. Despite the efforts, which are undertaken to end this curse, illegal intrusions of gold diggers always exist in some areas of their territory. They can be added to the illegal intrusions of wood producers and of bovine breeders. The botanical knowledge of the Kayapo tribe is highly developed on most of the plant species, which can be found in their territory. Sucupira, Urucum, contraceptive grass and antidote ...... are some examples of medicinal plants used by this ethnic group. In the past, the Kayapo tribe has worked for the description and the classification of their knowledge with the American ethnologist, Darrel Posey and with the museum, Emilio Goeldi, located in Belem. Many Kayapo people including the shaman, José Yté Kayapo, have described the use they did with these botanical plants. The aforementioned American researcher has undertaken a tremendous work with this ethnic group for more than twenty years. Unfortunately with the death of Darrel Posey the researches have ceased. Pedro Paulo Kayapo (in France from the 19th to the 30th of May 2005), son of the shaman José Yté Kayapo, is looking for the opportunity to resume the researches and to rediscover the descriptive work already performed. However, in order to continue, it is required to find financial resources and to induce a government involvement for the protection of this knowledge and for the development of research projects. Those projects could bring ethno-botanists and indigenous people to work together in order to produce practical results that can be added to the scientific publications. The researcher work helps to show the active principles and to classify the effects of plants. 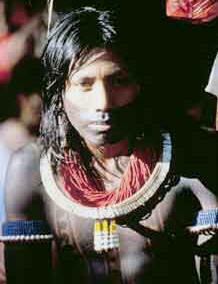 Kayapo people think particularly that the AIDS remedy can be found in the Amazonian forest. Therefore, they wish to develop a botanical laboratory project on their territory. The build-up of a program between indigenous people, the researchers, the government and the universities remains a primary priority that can be extended to the disclosure and protection clauses that will assist the fight against the bio-piracy and the biodiversity destruction. We should keep in mind, that if the Brazilian government has been able to claim a right on a license for the Ayahuasca plant, it was due to the official existing recognition of that plant as native of the Brazilian territory. This call is so urgent that the government begins to open talk meetings for the Amerindians. 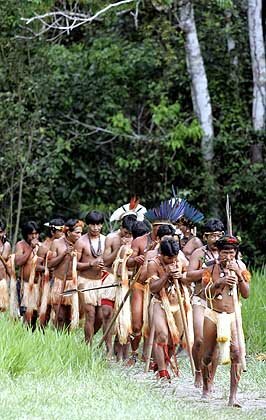 During the last April month, period in which the Indian day is traditionally celebrated, more than 70 ethnic groups have met in Brasilia the ministers of Education, Health, Internal Affairs, Justice, Land management ..... in order to present their dissatisfactions and their requests. Unfortunately most of the words that were concluded on a document of the federal government in terms of necessary changes for the indigenous territory protection, for their health preservation and for their education, find at the level of the federal states disagreements and conflicts of economic interests. The question of the illegal intrusion of indigenous territories and of the ecosystem destruction by mining companies, wood producers, bovine breeders and every kind of settlers is among the most sensitive concerns of many indigenous groups. Juridical texts, that are in force and that help to plot indigenous Brazilian territories and to officially define enough room in order for indigenous people to feed and to cure, are part of article 231 of the Brazilian constitution established in 1988 and of decree 1775 established in 1996. The process is as follows: a traditional territory is first plotted on field with the populations and then after many debates this territory or a part of this territory is plotted on charts. Thereafter charts are ratified and recorded. The survival of traditional populations depends on a concrete project for an efficient fight against illegal intrusion. This project does not presently exist due to a lack of a political will and of financial means. 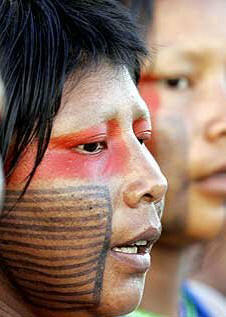 More information on indigenous populations and their territories can be obtained on the following Portuguese website: http://www.artedomito.com and on the different existing links from this site. Translation proposed by gaultier_philippe(at)hotmail.com on the 29th of November 2005.